Use Code: "15FISHING" for a 15% Discount on Your Fishing Gear! It seems like every old and wizened angler seems to have the same old advice—but what about the fishing tips that no one seems to mention before you head out on a fishing trip? Let’s cover some of the little-talked-about tips (and gear you should bring) that will make your fishing experience better. This might sound like an old fisherman’s tale or way of fooling new anglers, but the fact that red lures have a better chance of attracting fish is rooted in fact. Many fish, particularly bass, are attracted to the red color because they instinctively believe this means that their prey is injured. Red means blood—get it? So the next time you go to your local bait and tackle shop, you might want to consider seeing red. You could just be rewarded with a much larger haul than you’ve ever had before. That’s right—those tiny, disposable, cheap hooks you’ve been using might be in need of a little more tender, loving care. It’s been proven that sharpening your hooks can help catch more fish, as they’re more likely to catch deep in the fish’s mouth and stay there. There are plenty of different ways to sharpen your hooks, from specialized hook sharpening tools to good old-fashioned whetstone sharpeners. No matter your method, you’re sure to get more dependable sets when you’re out on the water. The key to good fishing is making sure that the fish see your bait, not you or your boat. How do you do that? By fishing upwind. Because fish like to swim with the wind, they’ll come upon your bait before they ever get to your boat, which means you’re less likely to spook them away. And an un-spooked fish is a fish that’s ready to be caught. Listen, we get it. Everyone likes fishing when the weather is beautiful. But the fact is that anglers who are willing to brave potential bad weather are more likely to make big catches. And you’re better off getting in before a storm, rather than after. That’s because fish can sense the pressure changes that come with an incoming storm, and are more likely to be active. So bring along your rain gear and get to fishing. We don’t want to sound like anyone’s mother, but it’s important to always bring along proper first-aid whenever you go out fishing. Sure, you’re not hunting bears, but being out on a river or other body of water brings its own set of risks—slipping and slamming a knee, or stepping on a broken shard from a glass bottle. 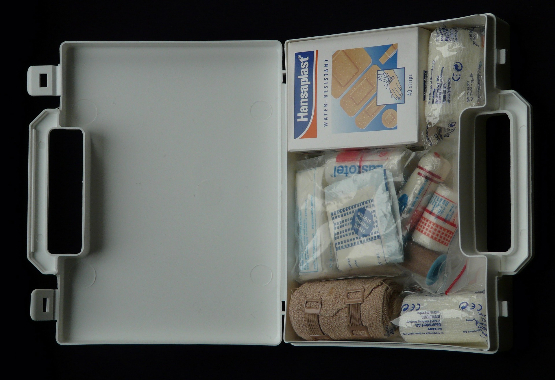 Nobody wants to cut a fishing trip short because of an injury, so be sure to bring some first-aid supplies to keep yourself safe. Who wants to run out of bait or tackle on a fishing trip? It can cut short a great catch and leave you wondering what could have been. With that in mind, remember to always bring more than you think you could possibly need. That applies to gear, bait, tackle, fishing line, food for yourself and your fishing buddies, and anything else that might run out if you’re not careful. There’s nothing wrong with being over-prepared. Being prepared for your next trip means carrying a lot of gear, and that means a lot of stuff that can fall into the river and get soaked. So keep your possessions safe with an Earth Pak dry bag. 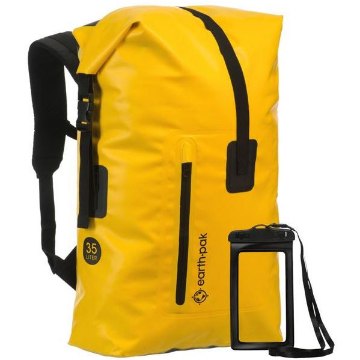 With sizes ranging from 10L to 55L, you’ll be able to keep everything from cell phones and keys to lures and reels safe and dry. 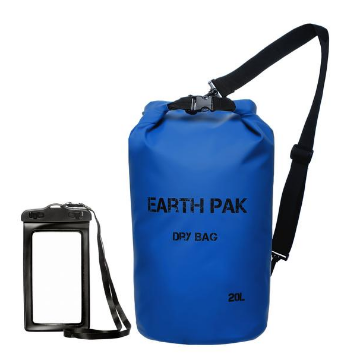 Plus, your Earth Pak dry bag can serve as anything from a pillow and wash bucket to an ice chest or water pouch. 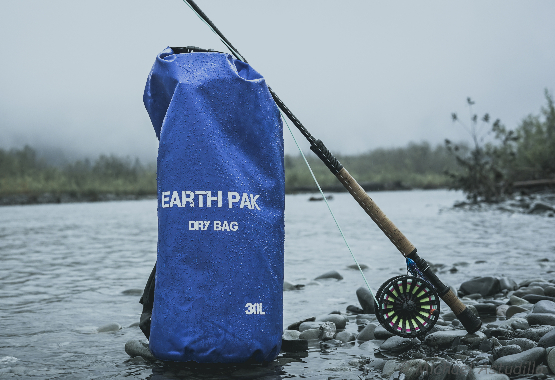 So don’t wait another minute—get yourself an Earth Pak dry bag today and make sure your next fishing trip is a winner. 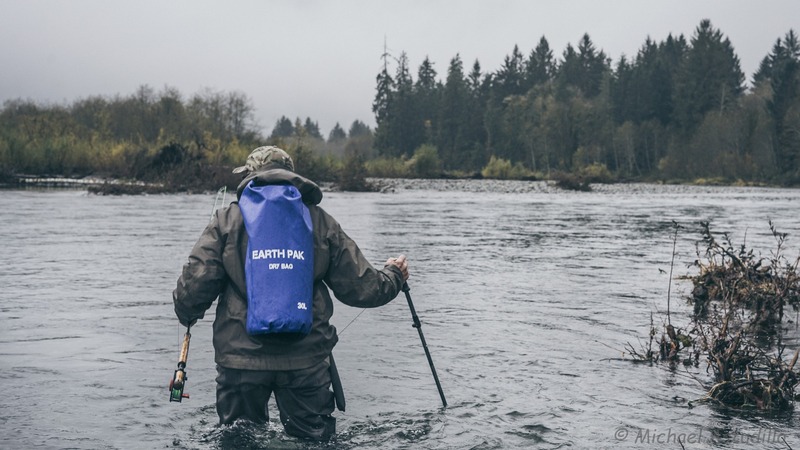 Our original and most popular dry bag product, the 10L or 20L dry bag is suitable for those who want to pack light but still have quality, heavy-duty gear that will protect valuable possessions from the outdoors. 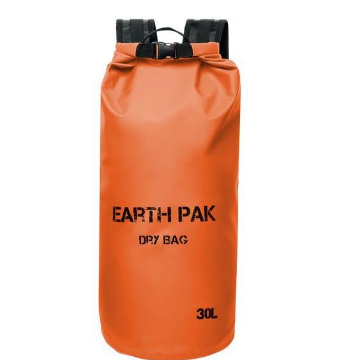 Earth Pak's 30L and 40L dry bag backpack is extremely durable and convenient for those who are looking for a reliable companion that will join them in trekking the outdoors for more than just a day. 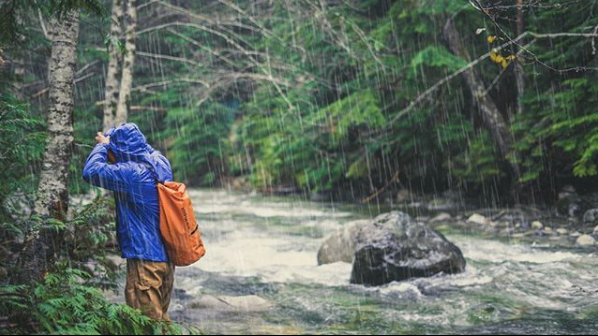 Our new Premium 35L Dry Bag Backpack has a large side waterproof pocket with a zipper, and a storage capacity suitable to pack in more than a day’s worth of items: a weekend’s worth of clothing, survival kits, water/food containers, etc.